Denzel Washington recreates a scene from "The Bone Collector" for an offensive lineman. I find it kind of funny that the best football film in the last 5 years is Adam Sandler's "The Waterboy." No other gridiron film in recent memory has been able to transfer the game to the big screen with the same amount of love and respect as that silly tale of the backwater boy with the anger management problem. "Remember the Titans" could've easily been grouped into this category, if only it were a football film. It isn't. It's an overwrought, appallingly condescending picture that dares to standup and sermonize over race issues in such an obvious way so all of us "moviegoers" understand that racism is "bad". Coming from producer Jerry Bruckheimer, I should have known. But also developed by star/saint Denzel Washington's production company, I should have run. It's not that "Titans" is a disaster, it means well. However, for it to be a financial success for Walt Disney Pictures, the film needs to take out all edge in the material and water down all the inherent evil that comes with such a plot. I stop myself when I write the word "plot", because, really, "Titans" doesn't have one. Just scene after scene after scene of noble African-Americans standing up to big dumb European-Americans (southern, of course) who practically dress in hoods and robes, with every other word coming out of their mouths a racial slur. Unlike life, there is no gray area to the prejudices presented in "Titans." Black=good, white=bad. And everybody has a lesson to learn. It's not storytelling, just political correctness in the worst way. How interesting would it be to watch a black player just loathe white people? Or to observe a white player who has no problem with his black teammates? "Titans" doesn't even try. It needs to appeal to all paying customers out there, thus the material (allegedly based on truth) is simplified and sanitized for your protection. The good intentions can't seem to stretch far enough to cover Denzel Washington's monotone performance. An actor of such strength, Washington is in serious need of a challenge. He's slowly (or already) becoming a cartoon with his endless sermons and ice cold delivery. Place him next to "are you sure he's not sleeping?" Will Patton and the endless parade of amateur actors who make up the Titan football squad, and you have one tedious film to behold. I support and promote mainstream entertainment all the time (which is why "Mission: Impossible 2" will be in my end of the year top ten list), but I hate it when I can literally feel myself being stroked. 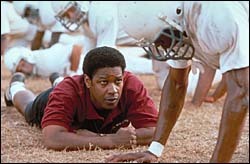 "Remember the Titans" is disgusting, manipulative dreck that comes along and hypnotizes audiences into thinking it's profound and enlightened. Hopefully, there is a whole nation of us out there that can understand right away the serious issue of race relations. I don't need Denzel holding a football in the humid Virginia autumn to explain to me that prejudice is vile.